SCOM can be a bit of a bear to the newcomer, there are several components thatÂ are quirky at best and if its not set up correctly or if you don’t know what you are doing things could go awry very quickly. Thank goodness there is a plethora of PowerShell commandlets for SCOM management and install to make things easier for us. Over the years drivers had been migrated with each server upgrade as well as when a new driver was updated by the manufacturer. Moving forward there is the question of how do I migrate the printers without bringing over all of the crap that I don’t need? 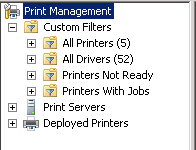 2. runÂ Printbrm -b -f Printserverconfig.printerexport in the same window, this will take some time to complete especially if you have a large number of drivers, wait for the tool to fully complete its task. 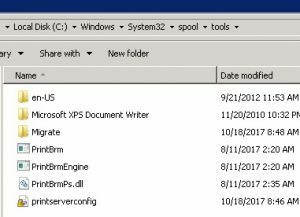 -sidenoteÂ I have seen this tool not work as expected when using PowerShell to be safe when using printbrm.exe you should use it in an administrative command prompt.